I made this scarf a couple of weeks ago for my husband and he likes it a lot. It's soft, warm and cozy and its texture shows beautifully in the sun. 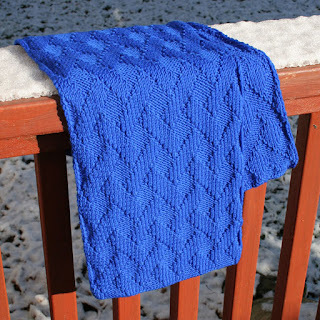 So I made a pattern for this scarf (it's quite simple) and share it now with you for free. Yarn – 3 skeins (50g / 1.7oz) of Knitca Delight yarn, 100% superwash merino wool, approx 150m / 164 yds, color #0286 Cobalt blue.